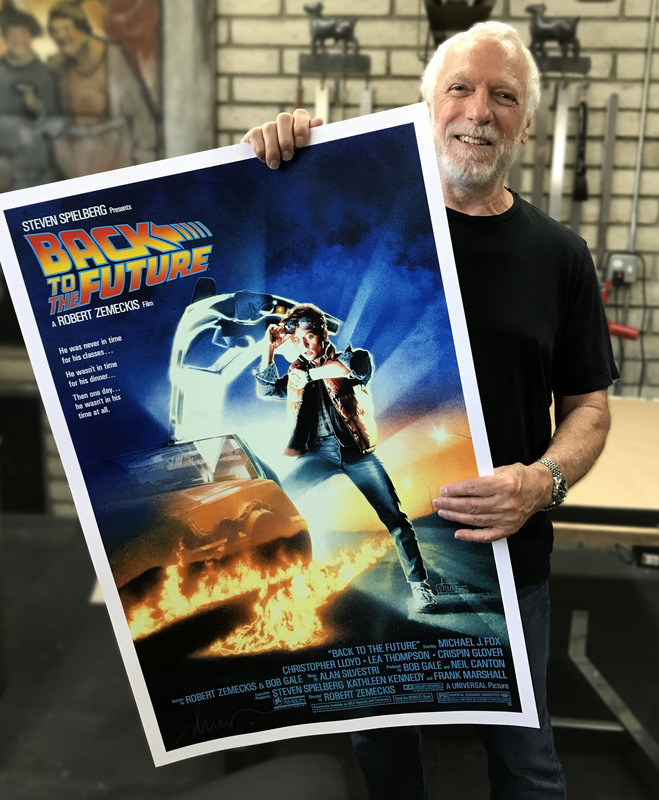 The future is now and Hero Complex Gallery has one final 2017 timed release for Drew Struzan’s Back to the Future artwork screen print. HCG used scans of the original painting to create the perfect print with close consultation and approval of Drew to make sure it looks like the original poster from the beloved trilogy. I remember seeing the first Back to the Future and falling in love with not only Marty and the Professor but the DeLorean! Those gull wing doors, the color and the crazy future that seemed so far away I wasn’t sure we’d even make it! Sadly I was never able to buy my dream car or travel to the future and the past but at least fans from across the world can now own a piece cinema history with the limited edition print. A lucky few will even have the print signed by Drew Struzan himself! This poster design will always bring back memories of not only seeing the movie as a kid in Davenport, IA but also my hopes for the future. So mark your calendar for the timed release and get your card ready for the perfect addition for any collector and an ideal Valentine Day gift to the love of your life, BFF, mom, dad or what the heck YOURSELF! Add-on Drew Struzan Signature – $50 ea. SO BE SURE TO SECURE YOURS TODAY! Q: How does a Timed Edition sale work? A: IN A TIMED EDITION SALE, A POSTER OR POSTERS ARE PUT ON SALES FOR A PREDETERMINED AMOUNT OF TIME – IN THIS CASE FROM DECEMBER 23RD UNTIL 11:59PM PACIFIC TIME ON JANUARY 15TH, 2018. HOWEVER MANY POSTERS SELL IN THAT TIME PERIOD WILL DICTATE THE EDITION SIZE. IF WE ONLY SELL 50 COPIES, THE EDITION WILL BE HAND-NUMBERED OUT OF 50. IF WE SELL 5,000, THE EDITION WILL BE HAND-NUMBERED OUT OF 5,000, AND SO ON. WE’LL MAKE AN ANNOUNCEMENT ABOUT THE EDITION SIZE AFTER THE SALE CLOSES. Q: How many posters can I purchase? A: BECAUSE THESE ARE TIMED EDITIONS, THERE IS NO LIMIT TO HOW MANY POSTERS YOU CAN BUY. Q: Can I combine this order with my other poster orders? A: NO….BECAUSE OF THE VALUE OF THESE POSTERS WE WILL NOT BE COMBINING ANY ORDERS TOGETHER TO HELP PREVENT AGAINST POTENTIAL DAMAGE. Q: Will Drew sign my poster, and if so, how much is it? 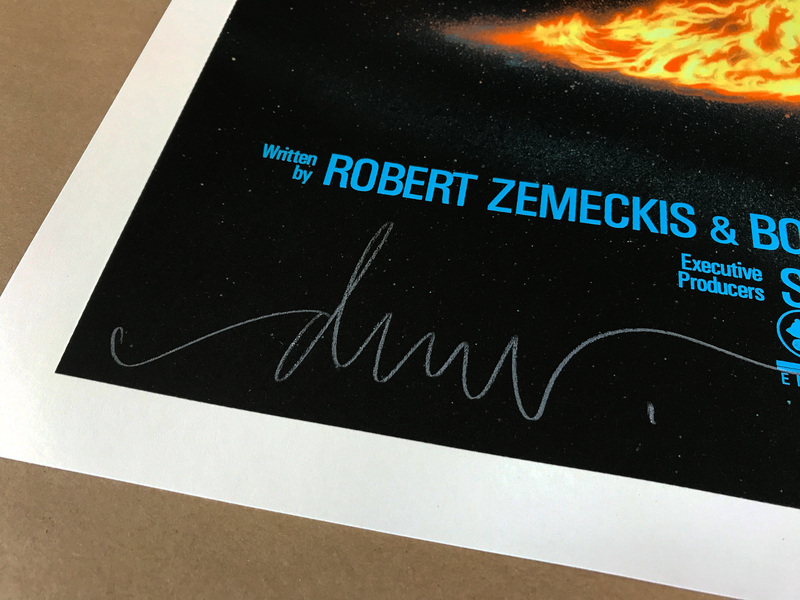 A: IN ORDER TO ALLOW FOR THE MOST OPTIONS POSSIBLE AND TO ALLOW AFFORDABLE OPTIONS FOR ALL BUDGETS, WE ARE OFFERING DREW STRUZAN SIGNATURES SEPARATELY FROM THE POSTERS THEMSELVES. IF YOU CHOOSE TO ADD DREW’S SIGNATURE TO YOUR POSTER WHEN PURCHASING, IT WILL COST AN ADDITIONAL $50. A: YES, WE DO SHIP INTERNATIONALLY, POSTAGE RATES ARE AUTO-CALCULATED DEPENDING ON WHERE YOU LIVE. Q: I live in Los Angeles, will you offer Gallery Pick-ups for this timed edition? A: YES, WE WILL BE ABLE TO OFFER LOCAL PICKUP THIS TIME, PLEASE USE COUPON CODE #LOCALPICKUP WHEN PLACING YOUR ORDER. A: THESE POSTERS WILL SHIP IN THE FIRST QUARTER OF 2018. AFTER THE HOLIDAYS AND ONCE WE KNOW HOW MANY POSTERS WILL NEED TO BE PRINTED AND SHIPPED, WE SHOULD HAVE A MORE ACCURATE SHIPPING ESTIMATE. Q: In the weeks since I ordered this poster I have moved / gone on holiday, can I change my shipping address? A: YES, PLEASE EMAIL US DIRECTLY AT SHIPPING@HCGART.COM AND WE’LL MAKE THE ARRANGEMENTS! NOTE: WE WILL NOT UPDATE ADDRESSES TO SHIP THE POSTER TO A THIRD PARTY. A: BECAUSE OF THE COMPLEXITIES OF ARRANGING PRINTING AND SIGNATURES ON THIS POSTER SALE, ALL POSTER SALES MUST BE FINAL, WE HOPE YOU UNDERSTAND.